Step 2. 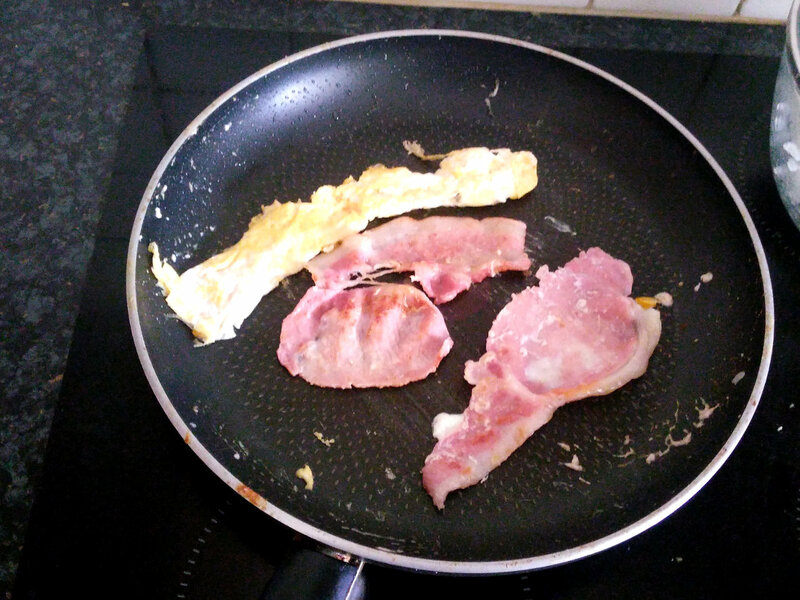 Two rashers of bacon and one egg, semi-scrambled into a kind of elongated omelette. Step 3. Two become one. Here’s why the omelette was elongated. Step 4. 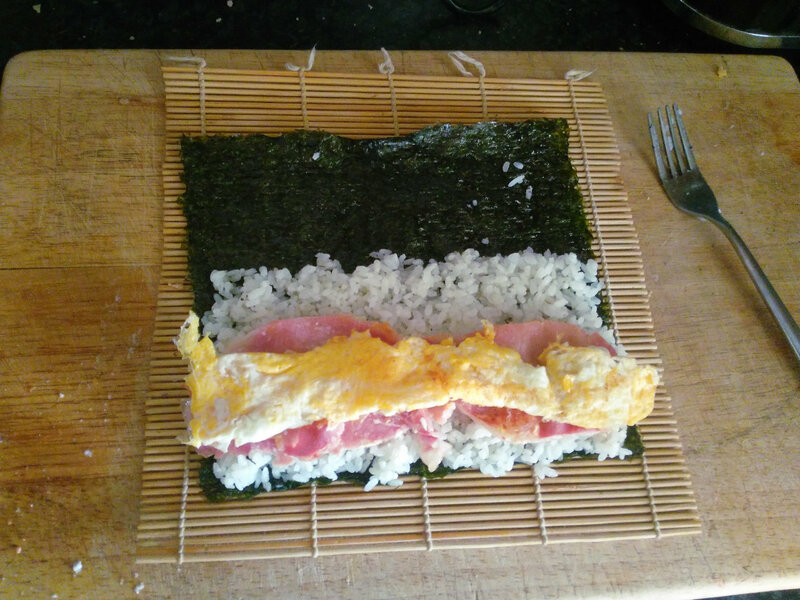 Roll it up and cut it into eight equal slices, just like any other sushi roll. 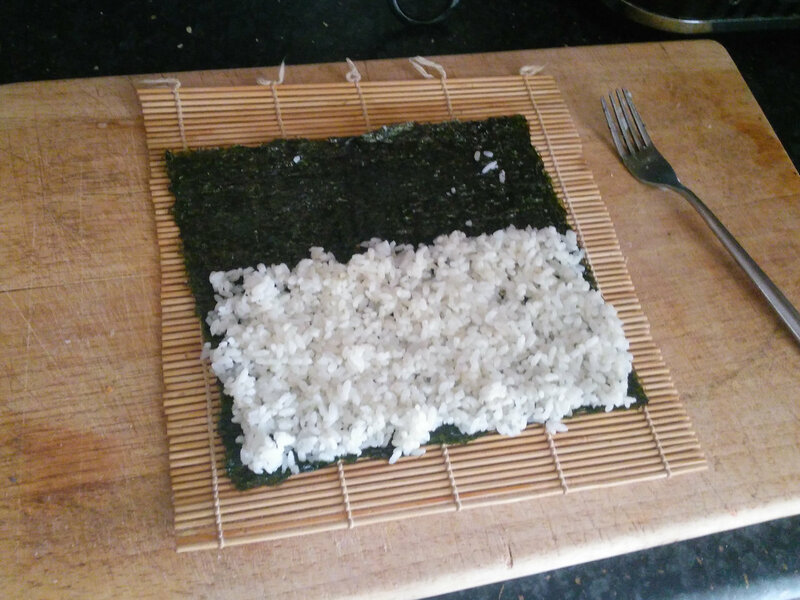 I served it with soy sauce, more out of habit than anything. It didn’t really need the sauce. How was it? Not bad at all. I’m not sure it tasted a lot better than a regular egg-and-bacon sandwich would have, but it had a lot more structural integrity. You could pack it in a lunch and have it not fall apart. If I do this again, I will fry the bacon for longer and try to get it really crispy. And I’ll sprinkle some black pepper on the egg. 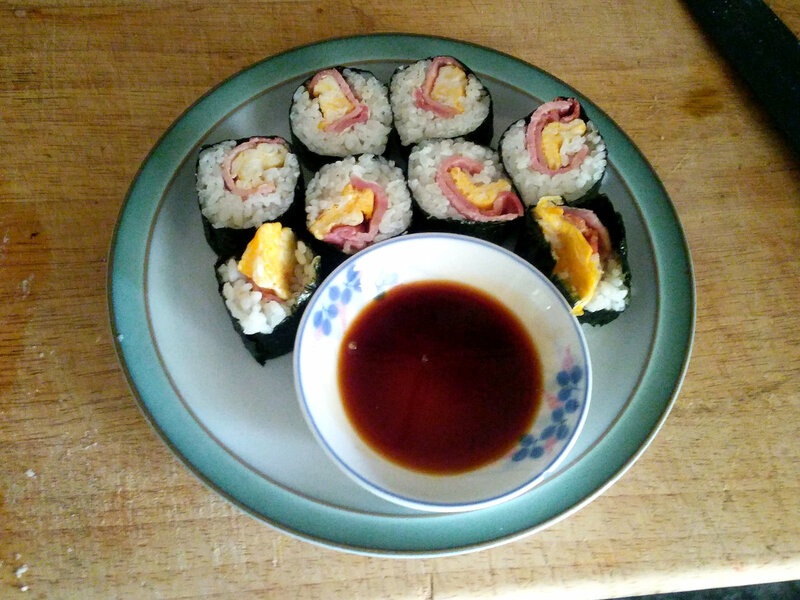 This entry was posted in Food and drink, Sushi. Bookmark the permalink. We often use a sheet of egg in our sushi, particularly for our vegetarian friends. A number of sushi chefs in the US use sheets of egg in their sushi, which is where we got the idea. Adding bacon is a great idea. For a more Japanese take, consider using unagi, smoked eel. You can also add all sorts of pickled vegetables. Go for it. Eating stuff one likes does make controlling one’s eating easier. It’s amazing how one gets into a rut eating stuff because it is there. Eating stuff one likes takes a bit of planning, and having followed your blog for some time, it is rather obvious that you like sushi. Oh, believe me, if I could lay my hands on unagi, I would most certainly use it. It’s questionable whether I would ever eat anything else. Alas, unagi is not an easy thing to obtain in rural Gloucestershire. “It’s amazing how one gets into a rut eating stuff because it is there.” <– That is exactly right. While sushi places are a bit liberal with the mayo, this seems like a situation that calls for it. Especially the spiced variety.